You probably know fiberglass insulation well. It’s been a staple of residential insulation for decades in the United States. You know, the pink stuff! The insulation that makes you itchy when you install it. Wait, they removed the itchy making stuff from it now, didn’t they? Fiberglass, while it’s very simple to install, has some definite shortcomings in the insulation game that might make you want to give mineral wool a look. The most common name you can find mineral wool going by in the states is Rockwool (formerly Roxul). Of all the different types of insulation, mineral wool and fiberglass are probably the most similar since they both come in batts that are trimmed to fit inside stud bays, but that is really where the similarities end. They are completely different materials, and after a little studying and some real world experience, I have come to be quite fond of mineral wool and I’ll tell you why below. Mineral wool is a stone-based mineral fiber insulation comprised of Basalt rock and recycled steel slag. It costs about about 25% to 45% more than fiberglass, but I feel its benefits more than justify the additional costs. The manufacturing process involves taking molten rock and spinning it while blasting it with cool air. It’s actually surprisingly similar to making cotton candy except instead of melted sugar you’re using melted rocks. This makeup gives mineral wool some of its fantastic benefits that we’ll talk about below. Check out the video below if you’re a dork like me and want to see how things are made. They are plentiful and wide ranging, which is why I have become a fan of this stuff. Not all of these benefits may matter to you, but definitely keep them in mind when and if you’re looking at how to insulate and old house. Unlike fiberglass which melts around 1,200°F, mineral wool has an extremely high melting point and can withstand fires up to 2,000°F making it one of the safest forms of insulation when it comes to house fires. It will not melt or off-gases any dangerous fumes in case of fire and functions as a fireblock, which delays the spread of the fire buying you valuable time to escape. Mineral wool is manufactured with a small amount of oil in the mix which helps give it a hydrophobic property. This characteristic keeps mineral wool performing effectively and does not lower it’s R-value when exposed to water. Any water that does end up on mineral wool rides down the surface rather than absorbing into the body of the insulation. This awesome feature and the fact that it is comprised of rock makes it virtually impossible for mold to grow on or in mineral wool. Compare that to fiberglass, which readily absorbs and holds water which greatly decreases it’s effectiveness and lowers its R-value when wet. Another bonus is that mineral wool is available in batts that fit 2×8 framed walls at R-30. Fiberglass? Not available in that size. The biggest advantage is the consistent R-value of mineral wool as opposed to fiberglass that comes with poor installation. Fiberglass is easy to accidentally compress which greatly diminishes its R-value. With mineral wool that isn’t an issue since it is already compressed. Installation of mineral wool is different from fiberglass entirely in that it comes in thick batts almost like a huge loaf of bread that must be cut by what unsurprisingly looks like a bread knife. Unlike fiberglass, you don’t have to compress it and then cut it with a razor knife before stapling a kraft paper face onto the stud. There is no paper facing because mineral wool does not come with a vapor barrier- you have to install your own vapor barrier if it is necessary in your situation. In my opinion, this usually results in a better installation because the vapor barrier is one solid piece, rather than a bunch of joints that have a greater likelihood of not being properly sealed. For mineral wool, you cut the piece to size but leave it a little tight so that it compression fits into place in the stud bay. You can install straps for installation on a ceiling to make sure it stays in place. A tight installation is best and I find that this is easier for most of us to accomplish than trying to ascertain if a piece of fiberglass is too fluffy or too compressed to perform properly. Mineral wool is not just for inside the house either. There are versions that can be installed on the exterior of a building in place of rigid foam. Installation on the exterior is an excellent use of mineral wool because of its hydrophobic properties. Combine that with its versatility of coming in configurations for 2×4, 2×6, and 2×8 walls, and you have an easy option for builders and remodelers to turn to. Especially for those of us in old homes where stud size is not always a standard dimension. With its dense composition, mineral wool is also easier to ensure proper installation around cutouts like electrical boxes and plumbing lines. I find that fiberglass is usually just compressed in these sections, whereas mineral cannot be compressed to fit around them. It forces the installer to do it correctly or not at all. It’s always a good idea to keep up with new products on the market that may work well for us old house owners. Mineral wool is something that should definitely be on your radar if it’s not already. While it’s not a new invention, simply a newer product, mineral wool has a place in insulating your old home and might be just what the winter ordered. We have the ComfortBatt R23 in between the ceiling joists in our basement. We can not install drywall to the ceiling as we need frequent access. We are trying to avoid a drop ceiling. 1) Can we leave the roxul exposed without risking air quality? We will be in the basement daily. 2) We would like to use a paint sprayer to cover the entire basment ceiling in a flat paint, including ductwork, pipes, etc. Can the Roxul be painted without compromising its fire retardancy? Would a certain type of paint (latex?) perhaps serve as a sealant to better keep the exposed roxul intact and safer to those of us living under it? Does anyone know about the production of the insulation. Does the production of mineral wool insulation pollute more than the production of fiberglass insulation? Where can I find that information? The production of Rockwool insulation is a dirty secret and one that the marketing folks at Rockwool work very hard to whitewash. Rockwool has 2 plants operating in North America with a third scheduled to start in West Virginia next year. The push back from the local community near the WV site started as soon as Rockwool released the specifics of their air pollution permit. In short, the typical Rockwool plant spews pollution into the air on par with a small coal burning power plant. As a past user, I was amazed at the intense carbon footprint left by this material I used to specify in my projects. It is far from green and many better options exist. If you want high R-value, air-tightness, and environmentally friendly, look elsewhere. Please ! A.Cobb, do tell us about the “Many” better options to Rockwool. And I love how you wrote “look elsewhere”, but didn’t tell where to look ?? Why leave us hanging like that ? I’ve just learned about RockWool, and find it’s properties quite impressive. But I’m eager to hear about these “many” even much better options. Don’t hold back, please ! Thanks for the info. Mostly good stuff!! Mineral wool is air permeable & certainly has the ability to retain moisture, whether it comes from direct contact with water or moisture laden air (fiberglass does too though). If your insulation is wet…you have A LOT bigger problems than worrying about your R-Value diminishing. Plenty of fiberglass manufacturers make high density batts such as R-15 for a 2×4 wall or R-21 for a 2×6 wall. Rockwool is actually R23 @ 5-1/2″ so you’re right, it can carry a higher R-Value there. 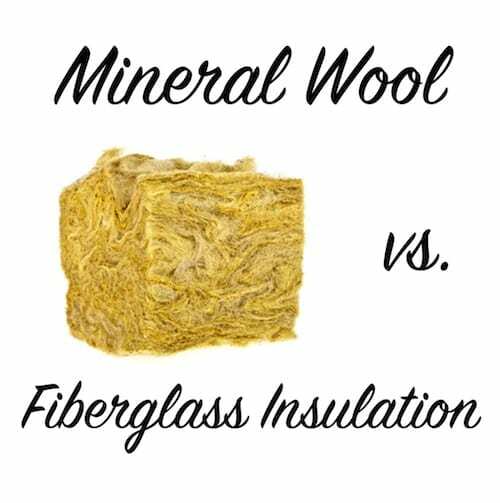 Saying that mineral wool is easier to install than fiberglass is just completely false. It’s much tougher to cut, and falls apart much more easily. I learned this the hard way, and have had jobs tank estimating mineral wool and fiberglass labor rates to be similar…they’re just not. I personally think Mineral Wool is a great product. We just don’t use it very often in Thermal Envelope applications. It any given R-Value it’s going to perform almost identically to Fiberglass, and costs quite a bit more. It’s GREAT for sound deadening though, and we use it frequently in interior walls, interior floors, home theater rooms etc. Thanks for the feedback Mike! Always love hearing from other folks and their experiences with these products. R19 fiberglass requires 2×6 stud walls. Please provide product information of who makes R24 fiberglass for a 2×4 wall. I think you are mistaken. Even Polyiso can’t hit the r value per inch you are implying. Dave, you may have misread my post. I said most 2×6 walls with fiberglass can only reach R-19. The Mineral Wool can reach R-23. When it comes to thermal insulation it is crucial to select the material that is best for your house. There are two materials from which you can choose, first is mineral will which has an R-value of 3 to 3.3 per inch as compared to R-value of 2.2 of fiber; the higher the R-value the better. Mineral wool is composed of 70% of recycled content, as compared to fiberglass insulation which is composed of only 30% of recycled content. Lastly, mineral wool costs less then fiberglass, as it only costs around $1 per square feet. Therefore, I would recommend you to use mineral wool for thermal insulation. I recently availed the service from Hire Custom, they did a great job for my house. I’d love to know where you’ve found Rockwool at $1 a square foot? Fiberglass comes in R-38 but Roxul tops out at R-30. I live in the Northeast and the energy Dept recommends R-38 or higher for attics in zone. Which should I use? the information which is missing is, how thick is the insulation you’re looking at, Mineral Wool can easily reach R-Values over 40 but the thickness for both it and Fiberglass are the defining component. Mineral Wool, by every measurement I’ve seen, beats Fiberglass. whether in blatt or blown form. What do you think about blowing mineral wool between asbestos siding and interior plaster walls (from the inside via holes at top of walls between studs) on a 110-year old house? I know most folks in historic preservation advise against insulating like this due to no vapor barriers. But would the hydrophobic properties of mineral wool be a game changer? I know there is some debate on whether to insulate the walls of an old house (most opinions are don’t do it). In the case of this product, would it be a viable product for wall insulation, or would I be better off leaving the walls uninsulated? Rockwool has been around for decades. We have it in the attic of a 1932 house. It left the residential market but I am so happy to see it’s comeback! Your text was very good. I am a student I can use your text? I’ve been thinking about using Mineral Wool in our crawl space of our 1890s Victorian, but I think it might be a little tricky- the studs are 3 ft. apart! (And as it is a limestone foundation, it will always be seasonally moist in there & in the basement). Do you recommend installing the batts perpendicular to the joists in that case and having to cut 1′ off of each batt (which is how some of the old & nasty fiberglass was installed) or would it be better to install the batts parallel to the joists and just cut every other batt in half lengthwise? (either way we were planning on installing strapping to the bottom of the joists to make sure that the batts stay up and off the dirt floor). We have a 1930’s Cape Cod with an uninsulated attic. So far my plan is to install radiant barrier across the rafters. Would you recommend supplementing that with insulation installed between the attic floor joists? You’ve recommended blown-in insulation in the past for attic floor insulation, are batts of mineral wool a viable alternative? My main concern is the ease and cleanliness of installation, mineral wool seems like it would be much cleaner to work with and not require blower rental or operation. Mark, both are good options for an attic floor. Blown-in insulation would be much easier to install in your situation. Mineral wool has the benefit of working in other situation that blown in won’t. I would stick with blown in for the attic floor because the installation with likely be 1/3 of the time! What do you think about just adding the sheets of Styrofoam-type insulation in our old homes, provided you’re already tearing off damaged clapboards to replace/repair? I have a 95 year old Sears Craftsman. The crawl space is damp. I’ve put down a moisture barrier. How high should I go on the foundation with the moisture barrier? Also, what insulation should I use to improve the R value. It is original save the kitchen and bathrooms. Thank you for your knowledge and help! If it’s damp I would first check to see you have enough ventilation in the crawl space. Then bring the moisture barrier at least 6-12” above the ground and seal the joint between the moisture barrier and stem wall. I like mineral wool for this application. Installed between the joists. Something else you may want to explore is actually sealing all of the vents in your crawlspace and carrying the vapor barrier within 6 to 8 inches of the sill plate. This gap will provide you the ability to inspect for termites. Also in this scenario you can actually control the moisture content in the crawlspace one of two ways. First you can create a supply and return from your duct work, provided it is located in the crawlspace. Or the method I prefer is to install a dedicated dehumidifier. I have done this in two separate crawlspaces and have kept a data logger for temperature and humidity and I can keep the relative humidity below 60% all year included in hot humid summers we get in Alabama. Also this would allow you to insulate the walls of the crawlspace with rigid foam versus. The joist bays. Anyways just my two cents. I don’t think I will ever own a home with a vented crawlspace again. Look up “crawlspace encapsulation” to see examples. YourCrawpsace.com has a great system which requires very few specialty tools. Also check out buildingscience.com to get a really good studies and white papers on crawlspaces. I think you might consider encapsulation. We installed Roxul in our 1925 Bungalow, and couldn’t be happier. We did it ourselves since it is a much easier and safer product than fiberglass, which we had priced out too to be installed professionally. Although Rockwool is more expensive than fiberglass, by installing it ourselves it came to less than what was quoted for fiberglass, so we ended up with a far superior product for the same price. An added benefit we discovered is noise reduction, the house felt a lot quieter after the installation, and since we were down to the studs, we also installed the soundproof rockwool in the walls separating the bathrooms from the bedrooms. All in all, a GREAT product. Awesome to hear your experience!